Interpol has put ousted president Viktor Yanukovich, his son Aleksandr and former prime minister Nikolay Azarov along with several other former Ukrainian leaders on the international wanted list. Interpol, which coordinates international police activity around the world, has put former Ukrainian President Viktor Yanukovich on its international wanted list following charges of misappropriation and embezzlement laid in Ukraine , according to anotice, published on its website on Monday. According to Avakov, Yanukovich, his son Aleksandr, former Ukrainian premier Nikolay Azarov, former healthcare minister Raisa Bogatyreva and ex-finance minister Yury Kolobov have been put on Interpol’s wanted list, TASS reported. Ukrainian authorities said a so-called red notice against the 64-year-old Yanukovich authorized any police force to hand him over to Ukraine for prosecution if he was detained, according to Reuters. Yanukovich fled across the border into Russia in February last year after he was ousted in the course of months of street protests in Kiev, organized after he scrapped signing an EU Association Agreement. In May, the Ukrainian parliament issued a warrant for his arrest, based on charges of corruption and abuse of power. 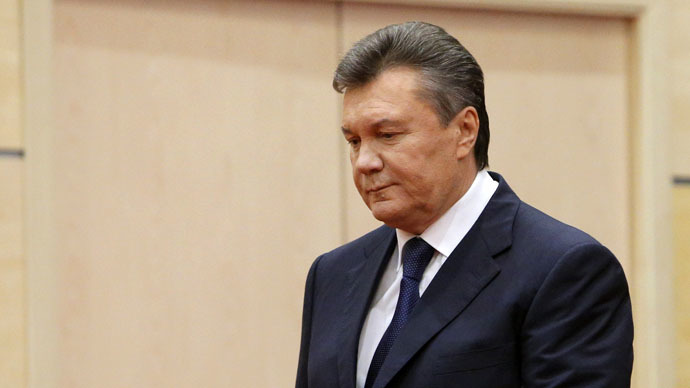 The current whereabouts of Yanukovich are unknown.